Bio: José Luis Fuentetaja was born in Madrid on July 21, 1951. At 13 he started working in advertising and attending the School of Arts and Crafts at Vallecas. At age 14 he moved to Switzerland and Geneva, was heavily exposed to art and decided to devote himself solely to painting. In the summer of 1966, he settled in Sitges. In Madrid Fuentetaja was taught by Peter Mozas in the school of Fine Arts and began a thorough grounding in the art of painting. At about this period he began painting in the street in Madrid and in Sitges, getting up close to all social classes, and financing his studies. He accomplished an astounding five thousand portraits in five years, of all ages and races. Now Fuentetaja begins to travel. He visits and paints in Paris, London and Amsterdam, and moves to the Canary Islands every winter for 5 years. Disappointed with the West, Fuentetaja visits the Orient. When he makes his first trip to India, it lasts for months and after almost 20 years he has been back more than 25 times, visiting Bombay, Katmandu, Benares and Nepal. He divides his year in two halves, between Sitges and the Calangute (Goa). 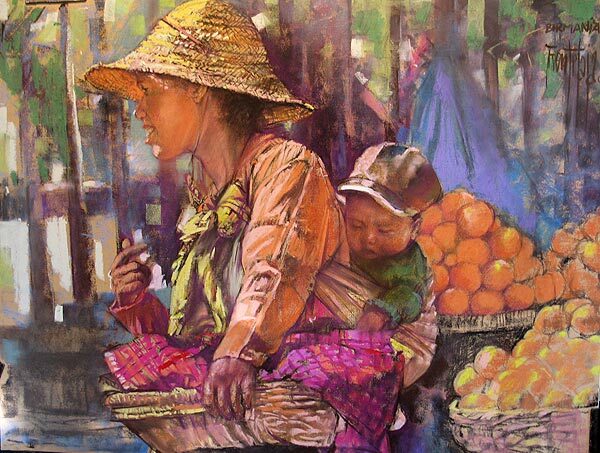 In recent years, Fuentetaja had painted many places in America and especially in Asia; he has painted in the Caribbean, Cuba, Bali, Vietnam, Thailand and most recently Burma (Myanmar), its people and its landscapes. Fuentetaja's favourite working size is 50x65 cm. He uses CarbOthello pastel pencils for fine details, the square sticks by Faber-Castell and Rembrandt, also Rembrandt soft pastels; usually on Canson paper. Navigation: This is a complex site, with the text in Spanish. Main menu remains on top of screen. To see the paintings, go first to Obra, but don’t omit to view the Etapas pages. Gallery: Miradas de Asia (Asian Perspectives); Coleccion de fotografia; Piezas no disponibles (click on ver mas piézas to go to a new page); Litografias en venta (this link is corrupted). There are basically two pages of paintings here – the scrollable right side of Miradas, and a second page of these, accessed by clicking on Piezas no disponibles. Image View: The gallery page has a section on the right with a vertical scroll bar, named Miradas de Asia. The thumbnails may be enlarged by clicking on them, but if you right click and open in a new tab or window, you can download. Information on medium and size is displayed. Burma Market is 65 x 50 cm. 600x453, 86 KB. Blog: Yes, within the site. Absolutely stunning, colorful moving works. This is an artist I discovered thanks to the French magazine, Pratique des Arts. It has an international focus, with a European emphasis, and is available on most French newstands, Maisons de Presse and Librairies (Bookshops, not librarys - the French for library is bibliotheque). When in France, have a look.